Dr. Chrono is trying to be the definitive iPad app for the doctor’s office. Looks good to me. If iPad’s are going to be the doctor’s tool of the future, they’re going to need a killer App that will enable the device to do everything they need it to do: schedule appointments, take notes, get lab results, bill insurance companies, file prescriptions, etc. Dr. Chrono can do all of that and more – it just might be the App your doctor is waiting for. The Silicon Valley startup has focused on creating an application that delivers on iPad’s promise to medical professionals: it can be the safe/reliable portal to all your patient’s information. Backed by Y Combinator, Dr. Chrono is generating some very positive buzz on tech blogs and getting press on mainstream feeds like the Wall Street Journal, NPR, and CNBC. It deserves all the praise. Check out the videos below to see some of the great features that makes Dr. Chrono a killer App for the iPad. As the medical industry continues its transition to electronic health records (EHR) and adopts digital standards, tablets could replace stethoscopes as a doctor’s most trusty sidekick. Programs like Dr. Chrono make that switch seem likely to arrive sooner rather than later. I’m not a physician, but if I wrote down all the different things I think a tablet should be able to handle in a medical setting, you can bet that all of them would already be included in Dr. Chrono. It can do the mundane things that many such apps can do: take notes, keep track of patients, send reminders, and interface with digital records stored online. There’s more though: the App can handle the graphs and charts of test results, scans of physical documents, x-rays, etc. We’ve seen other apps that handle such images, and Dr. Chrono is right up there with them in terms of clarity and ease of access. Next up in the great features, sending prescriptions out. Easy and quick. Got to love that! Although it is designed expressly for the iPad, you can interface with Dr. Chrono easily through your iPhone, web browser, or Android device. This allows a doctor to manage and review patient records even when they are away from their tablet. Part of the benefit of having web access is that it works for patients as well as doctors. With Dr. Chrono’s scheduling features, patients can arrange for appointments online. Sure, there are tons of ways to do that without this app, but it is well integrated into the software and is another bit of icing on the Chrono cake. Dr. Chrono has tons available on YouTube. Make sure to browse them if you want to see how the app works to give you access on Android, or if you want to see the billing features. Technically, Dr. Chrono is a free app, but don’t get too excited. The free version comes with very limited HIPAA compliant storage and you’ll only be able to access EHR through one iPad. 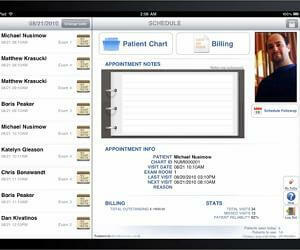 Starting at $99 per month, Dr. Chrono expands these features (more memory, up to 3 iPads) to fit a small practice. You can tell by pricing options that the company is aiming for the 3-5 doctor private practice as their primary market. Larger installations (10 doctors, lots of online help) is available, but at a significant price difference. As Dr. Chrono is quick to point out, however, adopting the iPad lifestyle could pay for itself. In the US, the HITECH Act allows medical professionals to claim generous incentives for moving to EHR. According to their PR, Chrono could qualify you for $44,000 from Medicare, and another possible $63k from Medicaid. I’m not sure everyone who wants Dr. Chrono should count on $100k+ worth of kickbacks, but these types of incentives for digital records are sure to help software like this to succeed. Despite my cheerleading on their behalf, I have no delusions that Dr. Chrono is a sure thing. Yes, Y Combinator is a pretty savvy investor (and startup enabler) and the app itself looks awesome. Still, the medical industry is a fickle giant, perhaps especially in the US. Dr. Chrono, and its competitors, are looking to be adopted by a market that has pressures facing it from all sides, and doctors could be squeezed into other technologies. Certainly companies like AirStrip, with their smart phone tracking of patient’s vitals, shows that there is serious competition out there. Big names like GE are investing in their own systems for telehealth and digital records as well. Nothing here is certain. Yet Dr. Chrono is a good product, it’s already seen use in the field, it does everything your small practice doctor is likely going to want to do, and its billing supposedly interfaces well with insurance companies. To me, that means that this startup has a real fighting chance. No matter which software we ultimately adopt, it seems clear to me that tablet computers are going to help usher in the new age of digital medicine. When that day arrives, the tablet may not only make doctors’ lives easier, they will make medicine better. They’ll have AI to help doctor’s make decisions, and they’ll ride around on the body of robots. …At least, that’s my dream.